Check Google or TripAdvisor for Street Art Tour Paris. We have the best reviews! We manage to engage with every single guest during our tour. We were born art lovers and we really know our stuff. Many of us are artists themselves. We do not need a script – every guide is a specialist in the subject, and we keep track of constant changes in the movement. There is nobody more qualified than us! We do not only read local news to know what’s going on – we are living it! Do you want to know about current exhibitions? Life performances? Projects? We’ve been there, we’ve done it. 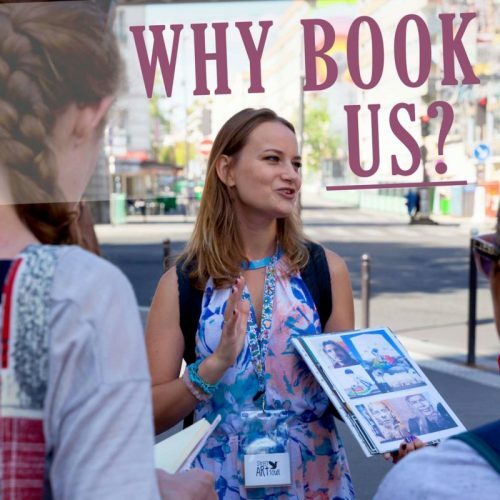 While most tour companies will only take you to Belleville or 13th arrondissement- we offer you more: Montmartre, Vitry Sur Seine, Canal de l’Ourcq, and even a very special alternative visit inside Louvre: Louvre versus Street Art. Live performance during the tour! Every twice a month we finish the tour with the inauguration of the new wall. Not only you get to see an artist at work; after the tour, we offer free drinks with artists and project organizers to celebrate the new piece! After every visit, we send out emails with the lists of artists we’ve seen on the tour and with links to their websites, articles or videos that compliment our tour. The atmosphere is very important to us. Our tours are not just boring lectures – we are making sure it is as educational as it is entertaining. Because proven by science – we do learn more when we are having fun!